Will Nietes turn Palicte away? 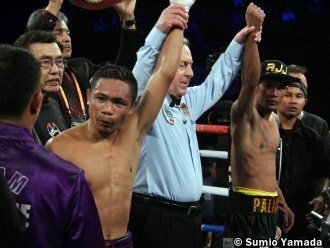 There’s a possibility that WBO superflyweight champion Donnie Nietes will decline to face mandatory challenger and countryman Aston Palicte in a rematch and instead, battle WBA titlist Khalid Yafai in a unification duel on the same card as WBC ruler Srisaket Sor Rungvisai’s defense against Mexico’s Juan Francisco Estrada in April or May at the Stub Hub Center in Carson, California. Palicte, 28, fought Nietes, 36, to a split draw in a bout for the vacant WBO 115-pound crown at the Forum in Inglewood last August. The WBO then tapped Nietes to meet Japan’s Kazuto Ioka for the vacant throne and ordered Palicte to take on Puerto Rico’s unbeaten Jose Martinez in a title eliminator. As it turned out, Nietes outpointed Ioka to claim the belt while Palicte blasted Martinez into submission in two rounds to earn the right to challenge the new champion. Matchroom Boxing’s Eddie Hearn recently announced that he is finalizing a card to feature Rungvisai against Estrada and Yafai against Nietes with the winners of both matches advancing to unify the WBO, WBA and WBC titles. Hearn has a tie-up with DAZN (Da-Zone), a subscription video streaming service for live and on-demand events. DAZN will make streaming available for 32 cards that Hearn is prepared to showcase in a year. Of the 32, 16 are earmarked for the US. The deal is for two years, renewable for another six with a total budget of $1 Billion. Rungvisai and Yafai are managed by Hearn. Soong said Nietes’ manager ALA Boxing “may have offers to cross over to another sanctioning body.” If Nietes meets Yafai and unifies the WBO/WBA title, it’s likely he’ll relinquish the WBO crown, leaving it open for Palicte to claim. Aldeguer said Nietes will skip a mandatory defense against Palicte if he engages Yafai in a unification fight. Yafai, 29, has a 25-0 record, with 15 KOs. So far, the Englishman has repulsed four challengers. Rungvisai, 32, and Estrada, 28, are no strangers to each other. Last year, the Thai outpointed Estrada on a majority decision. IBF champion Jerwin Ancajas, who is promoted by Top Rank, challenged Rungvisai recently to a unification showdown but was turned down when the Thai signed up with Hearn to square off with Estrada next.